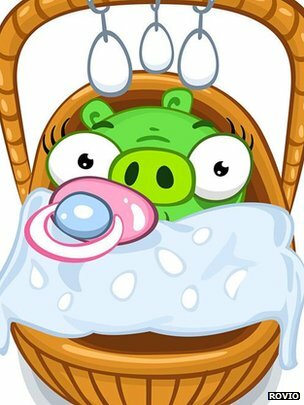 It seems like most of the world has become addicted to Angry Birds at some point in the last few years, and now Rovio, the Finnish company behind the mobile game, is launching a spin-off called ‘Bad Piggies’. Starting life as an iPhone app, Angry Birds has gone on to take over mobile platforms, as well as various merchandise ventures and has been downloaded in its many forms over one billion times. Now aiming to emulate this success, Rovio’s Bad Piggies is based on getting those evil little pigs to the finish line, collecting stars by constructing vehicles to get them there. With the latest instalment of Angry Birds Space not performing as well as its predecessors, all eyes will be on Rovio to see if they can get themselves back up to the top after their relatively unsuccessful Amazing Alex game. Will you be trying out Bad Piggies? Or have you had enough of those strangely coloured critters? This entry was posted on Thursday, September 27th, 2012 at 4:34 pm and is filed under Technology . You can follow any responses to this entry through the RSS 2.0 feed. Responses are currently closed, but you can trackback from your own site.